Decorating time: 4 Hours 30 Mins Approx. Using the method provided in the Overview video and Tools tab Mrs Jones walks you through the stages in creating the mixture. 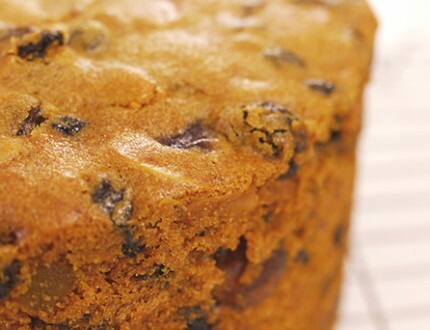 Soak the currants, raisins, sultanas, cherries and mixed peel in 2 tablespoons of the brandy or orange juice overnight. Lightly grease the inside of the cake tin and line it with a double layer of baking parchment or greaseproof paper. Line the outside of the tin with a double layer of brown paper or newspaper and tied it with string to hold it in place. Preheat the oven to 130C (Fan). Cream the butter and sugar with the lemon zest till soft, and pale in colour. Add the beaten eggs by slowly pouring them into the mixture in 3 batches and beat well after each addition. Sift the flour, cinnamon and mixed spice into the mixture and gently fold the ingredients together until just mixed in and no more. Gently fold in the remaining brandy or orange juice. Add the soaked fruit and almonds to the mixture and again, gently fold the mixture together. Transfer the mixture to the cake tin and spreading it out evenly to the sides of the tin. Make a small well in the centre to reduce the chance of a domed top to the cake and to encourage even baking. 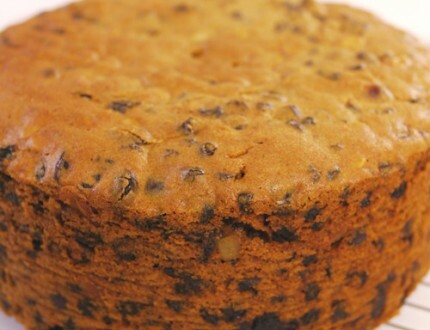 Lightly cover the top of the fruit cake with a circle of greaseproof paper or baking parchment with a hole cut out the centre. Place a newspaper or double layer of brown paper on the oven shelf and place the filled cake tin on top. Add a small bowl of water to the oven to provide moisture during cooking. Bake cake for approximately 3.5 hours. 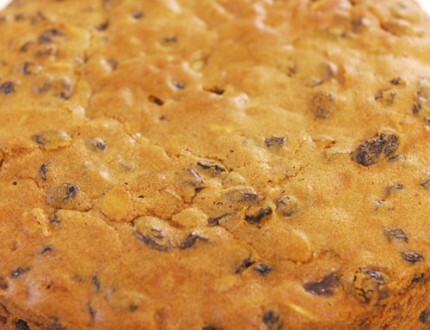 Remove the cake from the oven and pour a little more brandy over the cake while still hot. 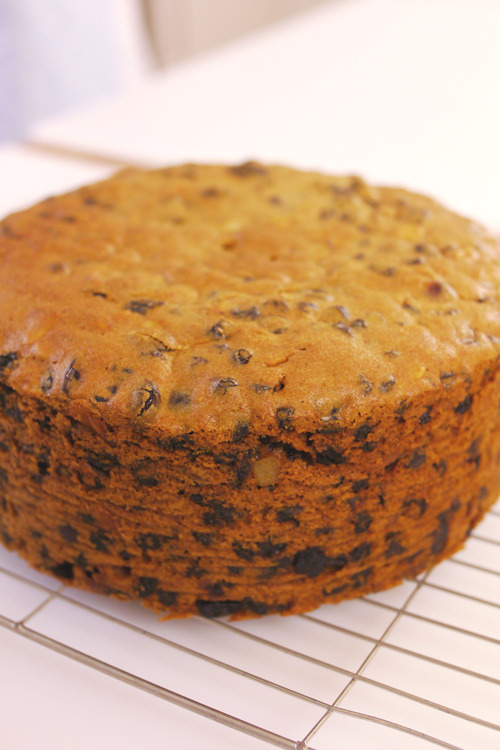 Leave the cake in the tin to cool down and then turn out onto a wire cooling tray. To store, leave the lining on the base of the cake, wrap in greaseproof paper or baking parchment, then tin foil and store in cool place. Watch how Mrs Jones removes the cake from the oven where she provides many useful hints and tips along the way. 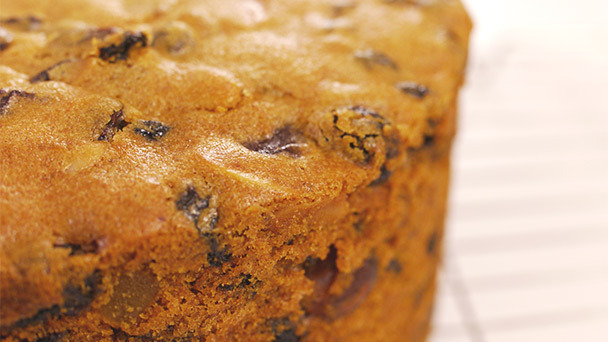 In this lessons Mrs Jones provides some other ideas in using and making this recipe. This recipe makes an 8" Round cake. To work out the quantities for your own cake size try our Calculator. 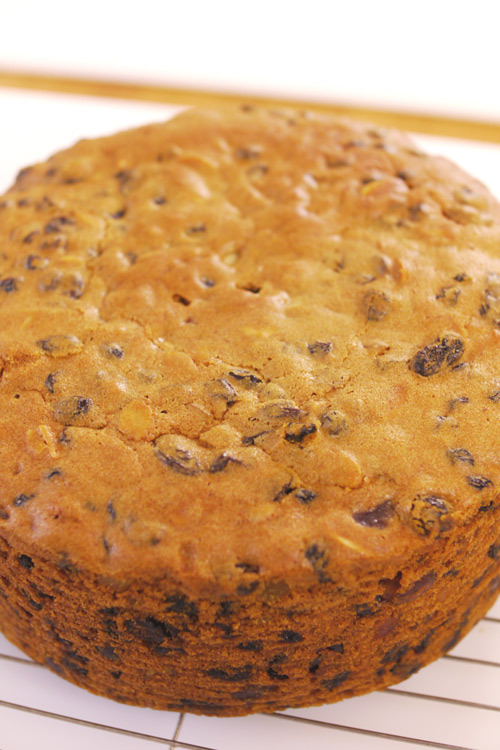 We have teamed up again with Mrs Jones to bring you this great light fruit cake. Please enjoy! Taught by her Mum to bake, many of you will recognise Mrs Jones as our expert baker. She is also an accomplished cake decorator. As a former nurse and midwife, Sheila has turned her passion for creating delicious, elegant, bespoke cakes into a very successful business. 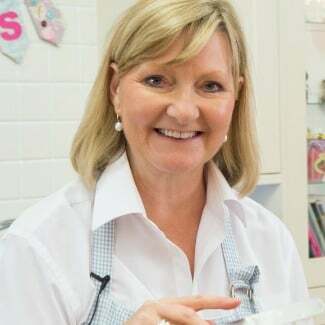 Over the years, Sheila's baking skills have been consolidated by achieving a professional diploma of PME Masterclass Certificates in Sugarcraft, Sugar Flowers Royal Icing and Piping, and she has worked with the very best of cake decorators in the country. She is Chair of the Glasgow Branch for the British Sugarcraft Guild, a member of the Scottish Association of Master Bakers and a founding member of the Glasgow Baking Club. You will all recognise her as the baking expert on our online tutorials. It was one of her students who said that 'Mrs Jones' kitchen is where we bake, learn, laugh and indulge'.